Gallia Commissioners recognized the coming March 29 as National Vietnam War Veterans Day. Among those present at the Thursday meeting were Pete Spencer, Larry Marr, Jon Lynch, Hollis Myers, Jack Bailes, Bill Mangus, Caroll Taylor, Gerald Baker, Michael Plymale, Gary Fenderbosch and William Guinther, along with Gallia Commissioners David Smith and Brent Saunders. 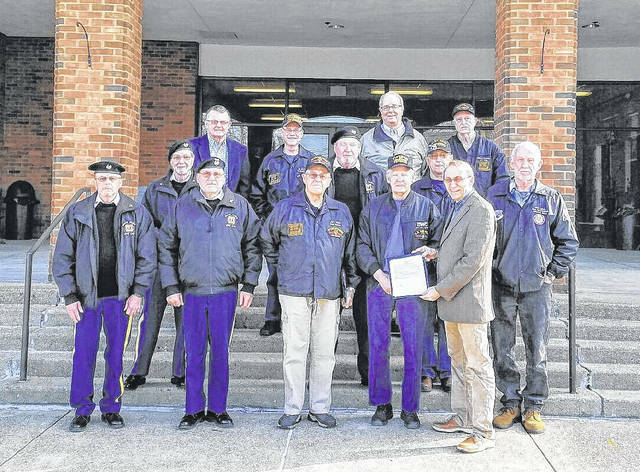 GALLIPOLIS — Veterans of the Vietnam War gathered at the Gallia Courthouse Thursday morning as Gallia County Commissioners recognized March 29 as Vietnam War Veterans Day in conjunction with national recognition signed into recent action by US President Donald Trump. The National Vietnam War Veterans Day is considered a memorializing holiday to remember the sacrifices and recognize those who were often not welcomed fondly after returning from Vietnam. The day has been in existence since 1973, according to Vietnam Veterans of America Chapter 709 President Larry Marr, through a variety of resolutions. The date had traditionally been observed on either March 29 or 30 and was now formally set to be recognized March 29 by Trump. The conflict in Vietnam has often been recognized as a controversial moment in US history. Marr guessed there may potentially be 400 to 500 Vietnam veterans in Gallia. Commissioner Brent Saunders is also one among thousands of American families who took the war to heart. Of Gallia Vietnam veterans who died in the 1960s and 70s, Marr and his colleagues remember them as Russell Hamilton, John Finnicum, Charles Neal, Wandle Hickman, Russell Blanton, Archie Hayman, Paul Yost, Cecil Matthew, Jr., Leslie Brucker, Roger Hawley, Fred Mooney, Albert Lee, Kevin Griffin and Richard Criner.